NEW YORK (CBS) Rihanna has officially moved on from her edgy "Rated R" days and has taken on a more girly and upbeat look with her new music video, "Only Girl (In the World)." 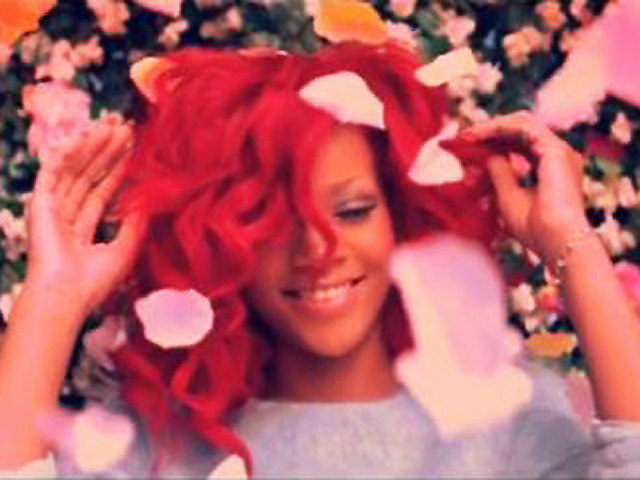 In the Anthony Mandler-directed video, the flame-headed pop star sports soft tendrils as she dances and sings by herself on a flowery hillside. "It's really, really beautifully shot in these crazy, crazy, crazy places," the 22-year-old singer told JustJared.com. "It looks fake, like something out of a postcard with the beautiful hills. We had a lot of sunshine those couple of days, so it really worked with the whole essence of the video." The single, produced by Norwegian hit-making duo Stargate, is high-energy and an ideal anthem for those on the dance floor, as the pop star sings her heart out to one man over a pulsing trance-like beat. "Want you to make me feel/Like I'm the only girl in the world," she belts on the chorus. "Like I'm the only one that you'll ever love/Like I'm the only one who knows your heart." "Only Girl" is the first single of Rihanna's fifth studio album, "Loud" which hits stores worldwide on Nov. 12.